Join us for an open house as part of MSUM’s 125th Anniversary. You are a big part of that history! The deadline to apply for the RN to BSN program is approaching. If you have more questions about our program check out our FAQ video featuring the chair of our department, Barbara Matthees. World Alzheimer’s Day is an opportunity to raise awareness about Alzheimer’s disease and the need for more education, support and research! 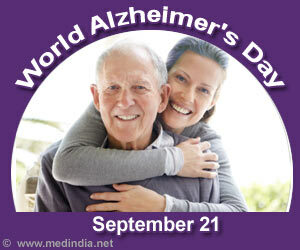 Alzheimer’s affects millions of people and families around the world. This year, Alzheimer associations across the world will focus their activities on the care required by people with dementia throughout the course of the condition. Alzheimer’s is a type of dementia that causes problems with memory, thinking, and behavior. Symptoms usually develop slowly and get worse over time, eventually becoming so severe for a person to do daily activities. Alzheimer’s is currently the sixth leading cause of death in the nation. There is no cure for Alzheimer’s disease and experts expect that at least 16 million people in the U.S. will have the disease by next year. There is currently no cure for Alzheimer’s, but treatments for symptoms are available and research continues. Current treatments cannot stop Alzheimer’s from progressing, but they can slow the worsening dementia symptoms and improve their daily life. There is a worldwide effort to find ways to treat the disease. Have you recently graduated, or are about to graduate and aren’t sure what’s next? If you are thinking about furthering your education, the Tri-College University Graduate and Professional School Information Day is the event for you! This event is designed to provide information on taking the next step of your educational experience. The Graduate and Professional School Information Day will help you find a program that best fits your interests and objectives. Information regarding the tests and admittance requirements will be available, all while being able to talk face-face with an expert on the application process. 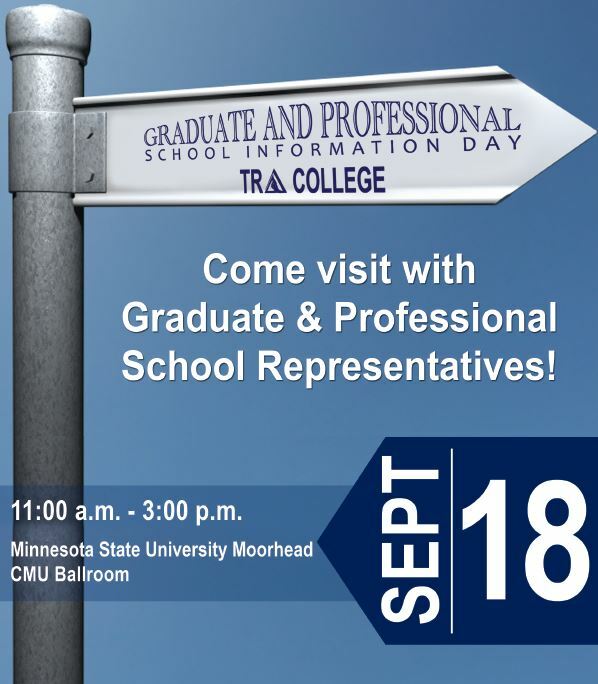 To learn more about these programs, please attend the Tri-College University Graduate & Professional School Information Day or contact the School of Nursing & Healthcare Leadership, at nursing@mnstate.edu or call 218.477.2693. Please contact the Career Development Center, at careers@mnstate.edu or call 218.477.2131, for more information. 1. Why has Sanford decided to institute mandatory influenza immunization for all of its employees this year? Influenza frequently circulates and is spread in health care settings. Employees and healthcare workers are the obvious means by which influenza reaches patients. Influenza immunization in health care workers has been increasingly shown to be an important way to protect our sick and vulnerable patients from contracting influenza. Several studies have documented decreased mortality rates for patients in some health care settings by more aggressive immunization of the workers who care for them. Experts believe that to protect the most vulnerable around us we must achieve immunization rates greater than 90 percent of the group to stop or interrupt the circulation of the virus. Despite past widespread availability and promotion of the vaccine, health care worker immunization rates have remained mediocre, with typically 60-70 percent of employees complying. Many institutions have gone to mandating vaccination as a condition of employment, and multiple authoritative health organizations have all strongly advocated for mandatory HCW immunization against influenza. 2. I don’t get sick, why do I need to be immunized? Influenza causes a spectrum of illness that ranges from no symptoms at all to severe respiratory illness. Many people with influenza may only have the symptoms of a cold. This often doesn’t stop them from going to work, but certainly allows them to unwittingly spread the virus. In a study of health care workers at the end of the flu season, laboratory testing showed that about one fourth of them had been infected with influenza that season, yet almost 60 percent could not recall any flu-like illness, and 28 percent could not recall even milder respiratory illness. These people become silent-spreaders of the virus to those around them. Persons with influenza may “shed” the virus to others around them for up to a week. 3. I don’t believe the vaccine works. I got vaccinated last year, and I still got sick. There are many reasons why someone might still get sick despite immunization. These include: a) exposure to the virus before the vaccine has had a chance to work; b) exposure to a respiratory virus other than influenza which may produce symptoms identical to influenza; c) infection with an influenza virus strain not covered in the vaccine that season; and d) a person did not mount a good immune response to the vaccine. Despite the above limitations, many studies clearly document the benefits of immunization for workers, including nearly cutting in half the number of sick days and doctor’s visits by employees, and almost an 80 percent reduction in laboratory confirmed influenza. 4. I got the vaccine last year, why do I need to be immunized again? Influenza is not a single virus but rather a family of viruses. Unfortunately, influenza viruses tend to mutate and frequently new versions are circulating each season. The vaccine must therefore be redeveloped each season based on the most recent dominant circulating strains. This requires re-vaccination each year to assure immunity to the current strains. 5. I’ve heard the vaccine might not be safe. I know someone who got the flu after receiving the vaccination. Also, doesn’t the vaccine contain mercury? People may get sick after the vaccine for many reasons (see #3). Most people are immunized with a vaccine made of killed virus, which cannot possibly cause influenza. Some people do get transient soreness in their arm at the injection site. Not all forms of the vaccine contain mercury. The amount of mercury in a dose of vaccine is approximately 30 times less than that found in a can of tuna. The CDC, NIH, FDA, and three independent scientific bodies have determined this to be completely safe. Influenza vaccines are simply among the safest in the history of vaccination. 6. I’m pregnant. What if I don’t want to expose my unborn child to the vaccine? The vaccine has been determined to be safe for all stages of pregnancy. In fact, pregnancy is a specific indication for the vaccine since influenza illness during pregnancy can be particularly severe and life-threatening to the mother and unborn child. You should always check with your physician to see if the vaccine is safe for you. 7. I’ve gotten sick after receiving the vaccine in the past. Are there medical contraindications to receiving the vaccine? Persons with a documented history of anaphylaxis or hives to eggs in the past may have had difficulty receiving the vaccine. This year, there is a new vaccine that is derived completely egg-free. This will allow anyone with a past egg allergy to now receive influenza immunization. Symptoms such as fever, aches, headache, and a sore arm are rare side effects of the vaccine that are self-limited and have no lasting effect. These problems do not constitute a contraindication to being immunized. Very rarely persons may have a history of severe allergic reactions (i.e. hives, anaphylaxis) to influenza vaccination that is not egg related. This would be a contraindication to receiving the vaccine. 8. I’ve heard all the arguments for receiving the vaccine but remain unconvinced. What if I have a personal objection to having to be immunized? The weight of evidence and the recommendations of multiple recognized authorities are that all health care workers should be immunized. Some religions proscribe against receiving certain medical care such as immunizations. Those with a seriously held religious objection to immunization would be exempt. Thank you to Sanford Health for this information! You can click on the link below to watch a video from Dr. Barbara Matthees our department chair on why the flu vaccine is required for students and why she believes the vaccine is so important. You MUST be accepted to MSUM before submitting your final application to the School of Nursing. Without being issued an MSUM Dragon ID number upon acceptance, you cannot complete your application to the School of Nursing. You may begin the RN to BSN application prior to obtaining your final admission to MSUM. Bridging Intervention to Increase Attendance at Initial Psychiatric Evaluations. Journal of Psychosocial Nursing and Mental Health Services, 51(5), 36-43. doi: 10.3928/02793695-20130320-01. According to the journal’s Executive Editor, Aileen Wiegand, “we initiated the JPN award for the best-written article of the year, which is chosen by a select editorial committee” (personal communication September 3, 2013). Dr. Schaumberg will receive the award on behalf of all authors in San Antonio at the October 2013 American Psychiatric Nurses Association Annual Conference. Dr. Schaumberg, APNP, DNP, is a 2011 Metropolitan State University graduate of the MnSCU Doctor of Nursing Practice Collaborative Program. Dr. Suzanne Narayan, PhD, RN, is Professor Emeritus at Metropolitan State University, School of Nursing, St. Paul, Minnesota. Dr. Tracy Wright, RN-BC, PhD, CNE, is a Professor at Minnesota Statue University Moorhead, School of Nursing and Healthcare Leadership, Moorhead, Minnesota.